The moment your child's Safety Turtle wristband is submerged in water, it activates a powerful alarm. The alarm, packed in a compact, portable base station, can be conveniently positioned in your home or carried to any other pool or water hazard. WARNING: Safety Turtle is NOT a substitute for effective swimming pool barriers or diligent supervision by adults. It has been designed as a "last line of defence" to help prevent the drowning of young children. The loud and piercing base station alarm continues to sound until your child has been rescued and the base station reset. Safety Turtle does not require any wiring or hardware in your pool and even the locking buckle on the wristband is simple, immediate and childproof. The base station – that links through an AC adaptor to your standard household electrical socket – can be set up in minutes and has a range of between a conservative 30 meters (100 feet) up to 60 meters (200 feet). No frequency settings are required ... the Turtle on the wristband is pre-set to communicate with the base station and is then permanently sealed for optimum security and durability. The set consists of a compact, portable base station, AC Adaptor and one Turtle wristband. Safety Turtle Wristband — You can purchase separate wristbands for each additional child. Several wristbands can be operated from one base station, as long as they are all the same colour (i.e. the same radio frequency). The sealed battery has a lifespan of three years. Safety Turtle Battery Pack — this is a handy option if you go somewhere where there is no electricity supply. Safety Turtle Wireless Gate Alarm — While other gate alarms sound at the gate, the Safety Turtle wireless system sounds in the house, so the caregiver hears it and can act promptly. The new Safety Turtle Wireless Gate / Door alarm provides a second layer of protection to the Safety Turtle personal immersion alarm. 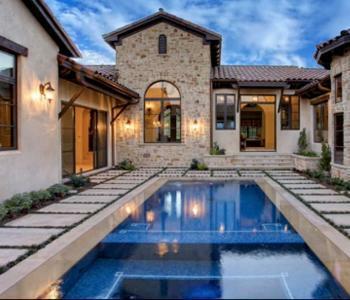 It can be used on all wood or metal frame doors, pool fences and property fences. One safety Turtle Base Station receiver within 60 meters works with any number of Turtle wristbands and gate and door sensor-transmitters of the same color. Safety Turtle can even be connected to your home alarm system. 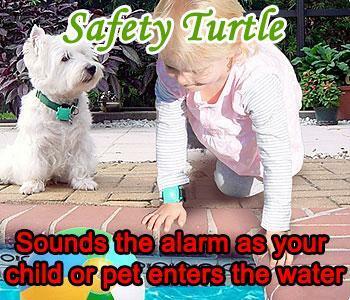 Safety Turtle for pets ..
Use Safety Turtle just as you would for a child: attach the Turtle Wristband to your pet's collar and you can have peace of mind, knowing that you will be alerted the instant that your dog goes in the water. Safety Turtle is great for dogs that cannot see the pool's edge or have little swimming ability. Safety Turtle is also used in pools without an easy point of egress for the dog.